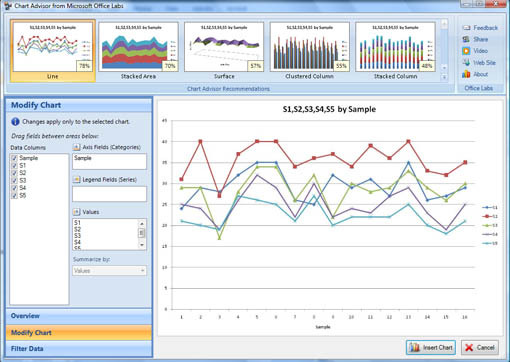 Chart Advisor is an addon for Excel 2007 that provides an alternative approach for creating charts in Excel 2007. It is a prototype from office Labs and is available as a free download. According to Office labs it uses an advanced rules engine to scan your data and, based on predefined rules, displays charts according to score. Based on the score it will preview charts you can pick up the best chart for your data and incorporate in your excel worksheet. Download the plugin and install it, it may download additional tools like Microsoft Visual studio for Excel. After installing it will show up as a button in Insert tab of office ribbon. 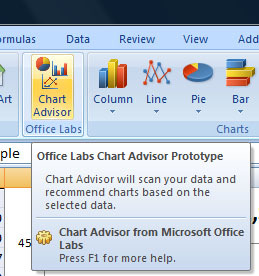 To activate chart advisor select your data and hit click chart advisor. It will analyze the data and creates various charts and displays the best chart based on score. You can hover on charts to see the charts in the main window. I used some real data here and it showed perfect graph for the data presented. But for some how when i use more complicated data it is not able to show up any graph. You can modify the chart once it is created using modify chart options on the left panel, once you are satisfied with the chart you can click insert chart to insert in your worksheet. Overall this is quite useful for people like me for presenting the data in interesting ways. It works Excel 2007 installed on 32 bit windows xp or Vista. The analysis is limited to 8000 cells at the moment and it promptly crashed after few mins of usage, typical of beta software. Good plugin.. Do you know any such plugins which works for open office too?